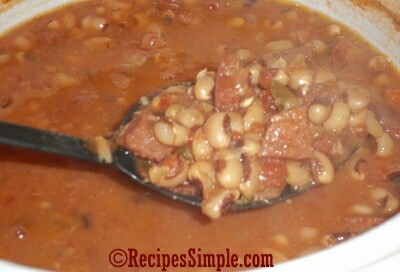 It’s a tradition in the South to eat Black Eyed Peas New Year’s Day for good luck. But these are delicious anytime served with cornbread and sweet tea! It’s great by itself or served over rice. Sort through beans and remove any pebbles or stones. Rinse. Pre-soak beans overnight by placing in bowl and covering the beans with enough water so they don’t dry up. In the morning drain and discard water. Place beans in slow cooker. Add the ham, water, onions, seasoning, Rotel and 1/2 can of pureed stewed tomatoes. Stir until mixed well. Cover and cook on HIGH for 5 hours. Turn to LOW and cook for 2 more hours until peas are tender.